Several years ago I some significant personal trama in my like and was looking for something to give me some peace. On of those things was this podcast and it helped me took at many things in my life in a way that was very healing. I would recommend this to anyone looking to address where you are in life and looking for some peace. Start with the first episodes and you should learn something about yourself. This podcast brought peace back into my life & helped me through some really hard times. Pls support! Thank you, Robert! Very thoughtful, insightful, personally rewarding. I've listed to alot of various inspirational podcasts; this one is far & away my favorite. I have gone back to listen to many episodes. Thank you Robert. Please come back!! This podcast has helped me through so much. I hope you return. Please bust out with a marriage pod cast, I'm new to all this and so far I really like it a lot! Thanks so much for the wonderful advice. Your podcast has helped me a lot. Thank you for all these great podcasts! My interaction with Robert has been very helpful. He cares about your growth. This podcast is one that everyone should listen to. Robert is very insightful, and makes you reflect upon yourself. His journey is everyone's journey. Listen and learn! 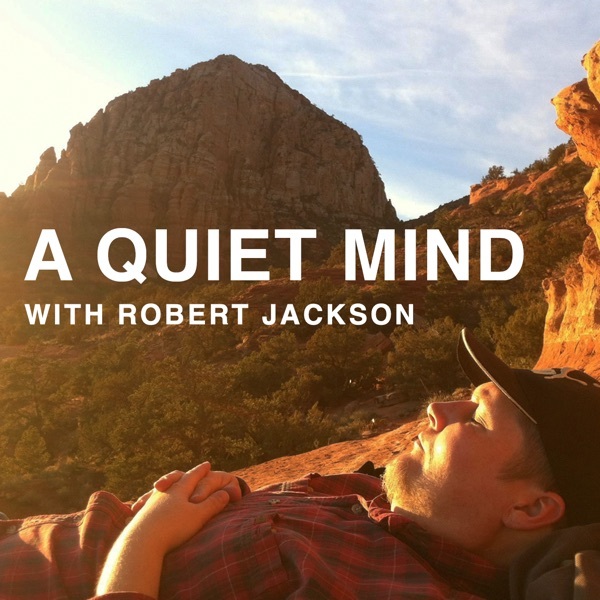 Robert Jacksons voice quiets the mind and calms the soul. God bless you Robert . Life Advice to its fullest! This is such great advice, especially for college students trying to find their place in the world. Also to help people understand how to work with others, listen to others, and live a full life. This podcast is wonderful. Thank you, Robert Jackson. Everyday I listen to at least one of the podcasts to remind myself of peace and joy available within a "quiet mind". So soothing and inspirational. I love this teachers gentle messages and teachings. THANK YOU! for those of us seeking a better way to live our lives. Mr. Jackson's message is worth listening to and his style and soothing voice make that very easy to do. Thanks for giving us this podcast! I feel like it'd be improved with music in the background. I don't feel this helps me meditate successfully. this is great gift to hear. I really enjoy these podcasts and get a lot out of each one. They are insightful, relaxing, and provide great guided meditation. I really enjoy his discourses and continue to get new insights from them. This was one of the 1st ones I found of this type. I have listened to others but keep coming back to hear Robert's calm, relaxing voice. Profound concepts that pop up in my mind during my day. I think it is one of the best, best, best. I listen to these on the train on my way to work every day. They help me prepare for any stressful situation that is to come. Would love Robert to write a book! Please keep posting. My life is in a state of flux that had me in constant anxiety. As I start each day listening to these podcasts, I find that I am becoming calmer and more centered each day. Of course we have to do the work inside ourself to create lasting harmony, but having a guide like Robert available gives us the tools to help us on the journey. Thank you so much..
First time listen was an amazing podcast for me. A wake up call. It was so great that I did donate to help keep A Quiet Mind available. I completly enjoyed the podcast and look forward to the subscription. This is a lifechanging podcast. It is as simple as that. whenever i'm a state of high levels of anxiety and stress, his message and voice calms me down very quickly. can't say this is your final answer to utmost happiness, but his advice on buddhist philosophies on acceptance and compassion has made me understand the nature of my anxiety and fears and finally just be comfortable with my environment. I would highly recommend this Podcast to anyone that is searching for a better way to approach life. Robert's messages are relaxing to listen to and contain the wisdom of the ages. His soothing voice and honest approach to the topics make this my favorite self-improvement guide. If you are ready to learn a more gentle approach to facing the day, this is for you. I can promise this, listen and you will learn. Thank you Robert for taking your time to help many others improve their well-being! You are fantastic! ...for taking the time to share your knowledge. Wouldn't the world be an amazing place if we were all breathing, observing, and accepting. Peace. I have been experiencing high levels of stress lately and spent a lot of time worrying. I was aware of this is and it concerned me. I started listening to these podcasts just last week and I feel like a new person! Robert is a fantastic speaker and it is easy to concentrate on what he has to share. Take some time to listen and pay attention to what he advises, and improve the quality of your life! This podcast is a perfect example of how powerful podcasting can be. It's just the way to start the day. The ideas are eye-opening and practical, and it's just the right length. Thank You Robert! Now THAT'S a quiet mind! !